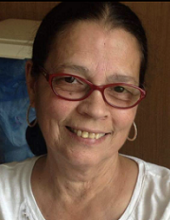 Norma I. Bosch (nee Andujar) of Cherry Hill, NJ, died November 21, 2018. Age 65. Beloved wife of Miguel Bosch of Cherry Hill, NJ. Loving mother of Ramon Alameda (Shirley) of Philadelphia, PA; Miguel Bosch, Jr. (Jennifer Blessings) of Cherry Hill, NJ; David Bosch (Larissa DeRiggi) of Toms River, NJ and Ricardo Bosch of Maple Shade, NJ. Devoted grandmother of George Bozarth, David Leader, Ramon Alameda Jr., Antonio Alameda and Sarah Jennel Cedeno Bosch. Dear sister of Luis Colon; Wilson Palm and Nancy Torres. Viewing Monday 9 to 10:45am in The Schetter Funeral Home, 304 West Marlton Pike, Cherry Hill, NJ 08002. Funeral service Monday 11am. Interment private. In lieu of flowers donations in her memory may be made to the American Cancer Society, 1851 Old Cuthbert Road, Cherry Hill, NJ 08034. To send flowers or a remembrance gift to the family of Norma I. Bosch, please visit our Tribute Store. "Email Address" would like to share the life celebration of Norma I. Bosch. Click on the "link" to go to share a favorite memory or leave a condolence message for the family.